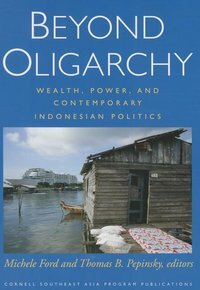 Beyond Oligarchy is a collection of essays by leading scholars of contemporary Indonesian politics and society, each addressing effects of material inequality on political power and contestation in democratic Indonesia. The contributors assess how critical concepts in the study of politics--oligarchy, inequality, power, democracy, and others--can be used to characterize the Indonesian case, and in turn, how the Indonesian experience informs conceptual and analytical debates in political science and related disciplines. In bringing together experts from around the world to engage with these themes, Beyond Oligarchy reclaims a tradition of focused intellectual debate across scholarly communities in Indonesian studies. The collapse of Indonesia's New Order has proven a critical juncture in Indonesian political studies, launching new analyses about the drivers of regime change and the character of Indonesian democracy. It has also prompted a new groundswell of theoretical reflection among Indonesianists on concepts such as representation, competition, power, and inequality. As such, the onset of Indonesia's second democratic period represents more than just new point of departure for comparative analyses of Indonesia as a democratizing state; it has also served as a catalyst for theoretical and conceptual development.